We work from plans or on site. When we contact you for the first time, we ask you to give us your date of birth, name and address and if possible a plan of the house, but this can also be done during our first visit. The first visit is free of charge (in Paris and the suburbs only). On this occasion, we will determine, using the Luopan (Chinese compass) the precise direction of your house among the 24 mountains. We also take references and identify problems with you. We work in our offices on the elaboration of the diagnosis, cures to use and dates which are favourable. The second visit takes place one to two weeks later. We present you with the plan and the solutions, and the suggested dates for the changes and according to the formula you’ve chosen, the talismans and cures and/or a numerological analysis. If possible, we place the cures with you, but as this is often not practical, we show you the exact location to place the cures that you can mark in your own way to avoid any confusion. When working from a plan, it is best if you can provide us with photos of the building and the surrounding streets, a photo of your front door and if possible a photo of each room. 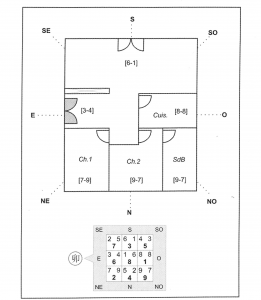 We will then send you the modified plan with a written summary of the new space arrangement. Once the cures are in place and the new orientation has taken place, results occur in 3 months maximum. The first visit is free of charge only in Paris and nearby suburbs. On this occasion, we determine with the Luo Pan (Chinese compass) precisely the direction of your house, among the 24 mountains. We also take surveys and identify problems with you. We work in our office on the development of diagnosis, cures to put and favorable dates. Second visit, one to two weeks later. The plan is given to you with the solutions, the possible dates for the change and according to your formula the talismans and cures and/or a numerological analysis. If possible, we put the cures with you but often it is not practical, so we show you the exact location of the cures that you can mark in your own way to avoid any confusion. When working on a plan, it is preferable to send us photos of the building and the surrounding street, a photo of your front door and if possible a photo of each room. We send the modified plan with a written summary of the new layout. In any case, we are available by phone and email to answer your questions and ensure the readjustments, if necessary, in the months following our intervention. Once the cures are in place and the new orientation is made, the results arrive in 3 months maximum.